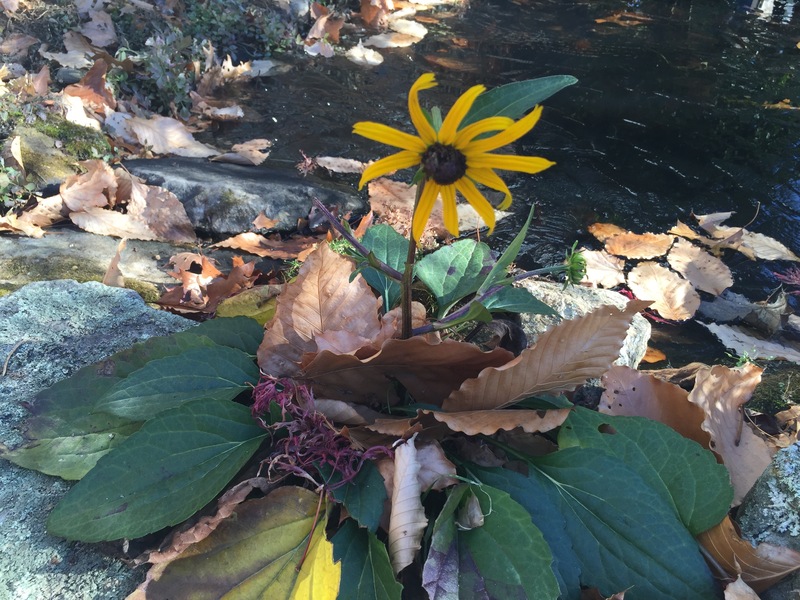 Two days before Thanksgiving, a lone black-eyed rudbeckia, surrounded by dead stalks and fallen leaves, blooms in my front garden. I bend into it and smile. November, west of Boston, I check the frost warnings with hope that my pint-sized yellow friend will beat the odds. I am uneasy in my selfish wish for nurturing temperatures given the wider implications of global warming. Do I feel guilty for the enjoyment? Yes and no. This time last year, I wrote, “a warm day, in the 60’s, a fantastic day for gardening, my body seemed fluid, bent and moved with ease as I cut back most of the perennials.” No ambivalence in that note. The late bloomer inserted itself between two large stones at the tip of the small pond. The full sun location, next to the front steps, is prime. All the surrounding garden plants, in lock step, died off while this rebel’s blossom invited me to check daily as to whether or not it would birth open. Late fall in the Northeast; it is unusual to find a late spring perennial growing as if the season were just beginning. How could I not be taken with its sweet youth and wonder at the possibility of how long it would withstand the frequent dawn frostings? I kid you not; I root for this rebel, take pleasure in its steadfastness. Yet, to experience pleasure makes me uneasy given that I am rooting for more temperate days for its growth and yes, my own selfish nurturance. The connection to this black-eyed sprout helps to sustain me during the autumn of my life when many dear friends are suffering from falls and terrible diagnosis. I am grateful for my sturdiness and ability to share what warmth I can, to try to ease their challenges. Thanksgiving arrives in two days. 60-degree weather is predicted. I have no control over the air currents or their trajectory just as I have no control over who thrives. What I know is that I will join friends and family to give thanks around my daughter’s table for my bountiful connection to family, friends and to this earth. Through daily gratitude writing, I have learned to notice and engage with the immediate relationships in my life, be they human, animal, plant or mineral. To attend is to be mindful and caring of another. The very act fuels the possibility of meaningful connection. I am grateful to share the story of my sprouting rudbeckia with the hope that whatever moves you as the solstice descends will be shared in meaningful ways. This entry was posted in Mindfulness, Nature, Relationship(s), Well-Being, Writing and tagged aging, global warming, gratitude writing, mindfulness, thankfulness on November 30, 2015 by fayewriter. Thank you, Hannah! I so appreciate your comment. What a singular late-blooming “rebel” — and which of us (in autumn, yes) couldn’t relate to her rugged persistence? I savored your story, Faye, and appreciate your steadfast, observant writing. And I so appreciate your thoughtful comment, my autumnal sister!